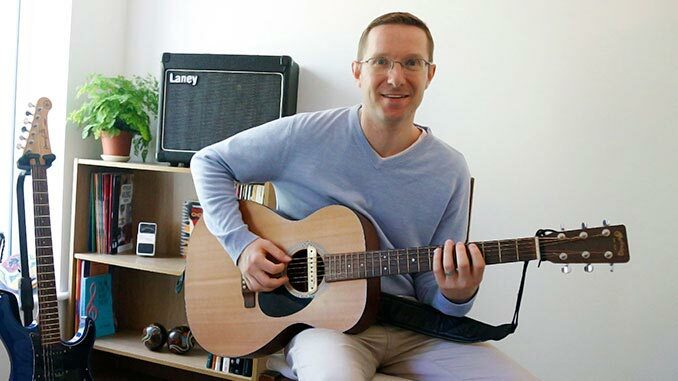 I’m Rob – the founder of Tunelectric Guitar Education, a new site dedicated to sharing my passion and knowledge for music and guitar playing. Being the youngest of four siblings, I was introduced to many classic albums early on, which helped shape my own musical tastes going forward. I was drawn to the guitar at the age of 13 after discovering my mum’s old classical guitar at home one day. It really captured my imagination and I knew I had to learn more about how I could make sounds out of it! 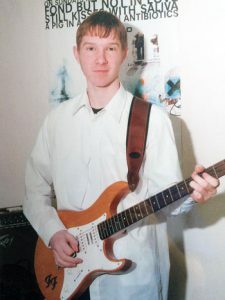 Once I’d mastered some basic chords from a teacher during my school lunchtimes, I was able to play in summer fundraising concerts and also started a garage band with my friends. After finishing school I studied music at college then university and played in many different styles of bands along the way. I love to play and write songs on my guitar too and want to share my passion to inspire newcomers to the instrument. "name" : "Tunelectric Guitar Education"
Here at tunelectric.com you’ll see me playing electric guitar as standard, as I believe it to be the most satisfying and forgiving route for newcomers. Having said that by all means if you know you want to be an acoustic player the key skills are transferable to acoustic. This is a one stop shop for beginners of all ages, focusing on the fundamental aspects of technique, combined with knowledge and tips you will need to enjoy and progress in your playing. Learning any instrument from scratch will be a challenge but an electric guitar is a great way to express yourself and so much fun can be had when you nail that riff you’ve always wanted to play! Some instruments are limited to single notes only, or too large to carry with you, however the guitar is a perfect and portable tool to accompany other musicians or as a solo instrument in it’s own right. The electric guitar can be heard in a huge variety of music and as a beginner, it is a great advantage to be open minded to all music as a willingness to learn different styles can only make you a more varied and accomplished player in the long run! If you have always fancied the challenge of learning the guitar but are struggling to know where and how to start, you are in the right place! I aim to keep my teaching style as clear and concise as possible, arming you with the right information at the right time allowing you to progress at your own pace. I’ll also give you tips and advise and share my knowledge of the instrument. ‘Practice makes progress!’ (practicing should be fun and there is always something new to learn at every level) but that doesn’t mean you can’t have fun along the way! A vast amount of popular songs are suited to beginners, so with a bit of elbow grease, you too can be strumming along to your favourite songs in no time. Through ‘Tunelectric’ I am here to help and support you on your way to any goals you may have with the instrument and I am happy to answer any queries you may have. I wish you every success in your transformation on becoming the player you have always wanted to be. © 2019 Tunelectric Guitar Education | All rights Reserved.